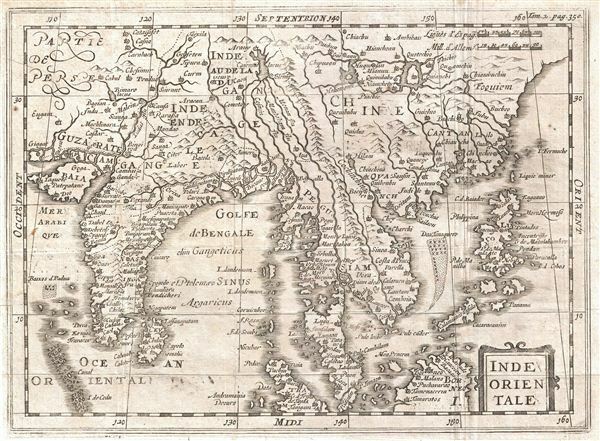 An uncommon c. 1700 map of India and Southeast Asia most likely drawn by Phillip Cluver. Centered on Siam (Thailand), Cluver's map covers from western India and the Indus Valley eastward as far as China, the Philippines, and Borneo, inclusive of India, Ceylon, the Gulf of Bengal, Southeast Asia, the Malay Peninsula, China, the Philippines, and parts of Borneo. The mapping of the region is noticeably primitive, especially as regards the overall form of India and the orientations of the inland river systems. Cluver maps the apocryphal Lake of Chiamay, which he identifies is Cawmai, roughly in what is today Assam, India. early cartographers postulated that such a lake must exist to source the four important Southeast Asian river systems: the Irrawaddy, the Dharla, the Chao Phraya, and the Brahmaputra. This lake began to appear in maps of Asia as early as the 16th century and persisted well into the mid-18th century. Its origins are unknown but may originate in a lost 16th century geography prepared by the Portuguese scholar Jao de Barros. It was also heavily discussed in the journals of Sven Hedin, who believed it to be associated with Indian legend that a sacred lake linked several of the holy subcontinent river systems. There are even records that the King of Siam led an invasionary force to take control of the lake in the 16th century. Nonetheless, the theory of Lake Chiamay was ultimately disproved and it disappeared from maps entirely by the 1760s. This map was originally drawn by Cluver in the early 1600s and was reissued many times – often posthumously – well into the early 18th century. The current example was prepared for Martineau de Plessis' Nouvelle Geographie, published in 1700.